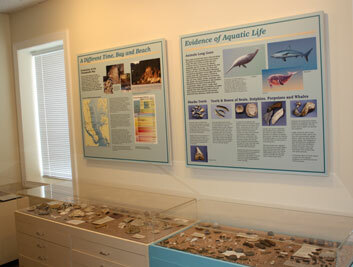 We have several interesting exhibitions for you to explore when visiting the Bayside History Museum. Come and see the new exhibit dedicated to the Chesapeake Beach Amusement Park, complete with Merry-Go-Round and reproduced Dentzel carved carousel animals. 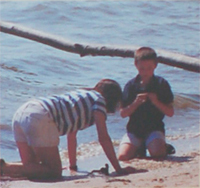 “A Day at the Beach” featuring paleontology, archaeology, bathing beauties, restaurants, boating, fishing and gambling. Sharks' teeth, whale bones, Indian implements, sea shells, coral...This exhibit has it all. Learn about the history of the region through the artifacts assembled here. This exhibit was designed especially for children. For more about this collection, see our What's New page. Camp Roosevelt, Maryland's first permanent Boy Scout Camp, is considered one of the earliest "permanent" camps in the country. After many restorations, it is still in use today as a private residence. Come to the museum to learn more about this famous Boy Scout Camp. 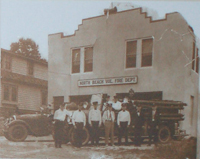 The first North Beach Fire Station sat on land deeded to the North Beach Fire Department by Mrs. Dora West on October 17, 1926. Come see our North Beach Fire Department exhibit to learn more. playing the slots, circa 1950s. This exhibit contains many interesting photographs and memorabilia documenting the region's people and places. Come see it all! Learn the importance of the War of 1812 in this area.